Travelers to Dubai has a treat in-store for them – Palm tree-shaped WiFi and charging stations are being installed at the city’s beaches. Dubbed as “Smart Palms”, the stations are made in the United Arab Emirates, and stand six meters tall, while emitting WiFi signals covering a radius of 53 meters. Smart Palms also offer mobile charging facilities with a capacity to serve about 50 users at a time, while displaying information on Dubai’s attractions, weather, beach rules, guidelines and sea conditions. Additionally, travelers can quickly charge their mobile phones and tablet computers as well. 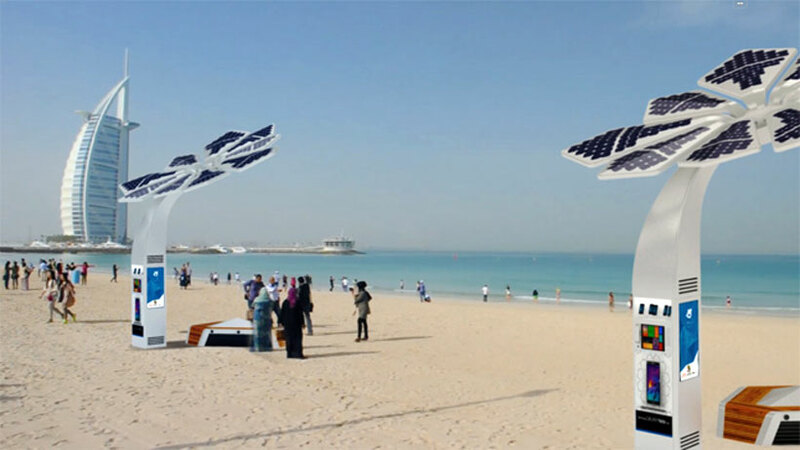 Dubai Municipality recently installed them on the beach next to Burj Al Arab Hotel and plans to cover all open public beaches in Al Mamzar, Jumeirah and Umm Suqeim.